Fiery Furnace- three hours of endless fun and hands-on learning! 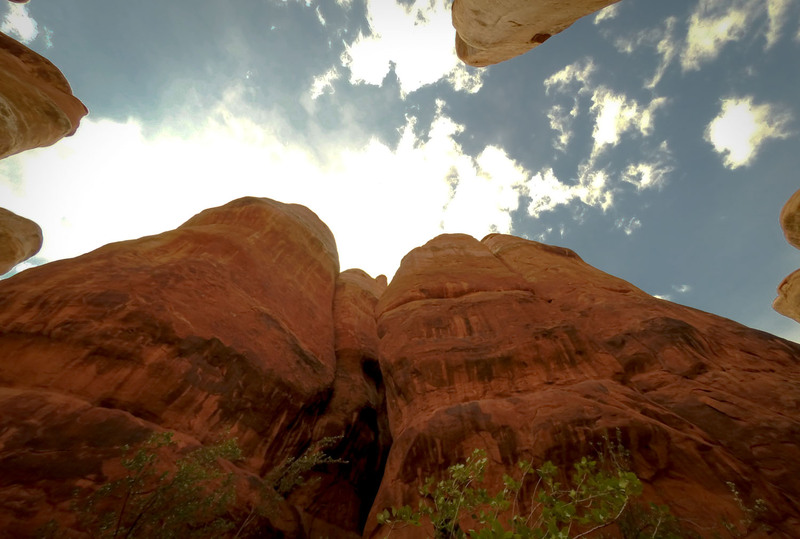 It gets its name because of the iron deposits in the rock and in the afternoon the sun beams down on the sandstone walls and lights them up like fire. 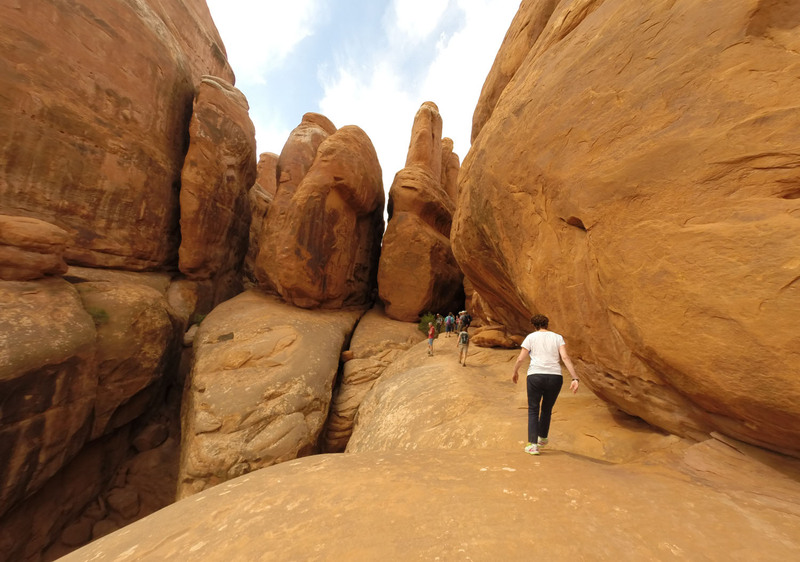 The fiery furnace is a labyrinth of formations extremely different than anything else at Arches. It’s a limited access area (permit only) so only a handful of people get to see it each day. Permits are hard to get so plan ahead and get them online if you can. There’s a parking area and the tour group meets just to the side of the restrooms. The restrooms are pit toilets and, again, there’s no place to refill your water bottle so be sure to bring plenty with you. The day we arrived there were six cancellations so we were lucky. The permit does cost money and there aren’t any discounts unless you have a certain type of yearly pass. Our America the Beautiful pass wasn’t eligible for a discount. At the time of this writing it cost our family about $40 for the tour (different prices based on age). When we purchased our tickets the park rangers had photos showing how demanding and difficult this hike can be. You have to have moderately strong upper-body strength and can’t be too afraid of heights. 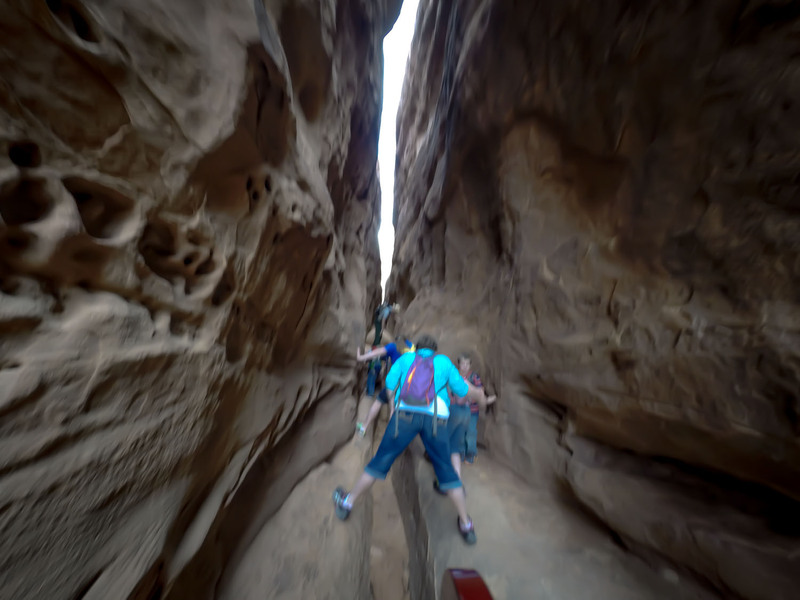 You’ll have to shimmy up and down rock formations and jump across cracks that are about 2 feet wide. Honestly, it was no different than playing at a jungle gym at a kiddie park. 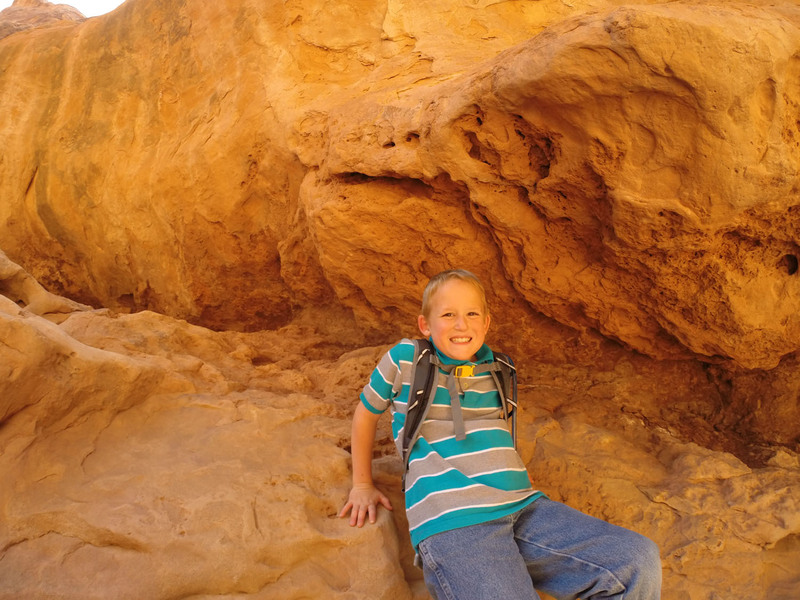 We had a blast and the speed of the hike was very comfortable and non-strenuous. But, we kept reading online how “this hike isn’t for everyone” and I was worried. Once you start you can’t go back. You have to finish. I was worried that it would be too difficult for the younger kids. The more I read online the more I was worried. Sure, they had a few photos showing some of the obstacles, they even had a short video showing some. These didn’t seem to help. So, we decided to do it anyway and to make our own video. We tried extra hard to film each obstacle so you can make a better-informed decision if this adventure is a fit for your family. No pets or children under five are allowed. They turn people back that don’t have adequate shoes. Five of us had tennis shoes and our oldest daughter was wearing flat Converse. She said she didn’t have any issues. You must bring adequate water. Follow the recommendations on their website. www.Recreation.gov They won’t let you hold your water because you’ll need both hands to maneuver around obstacles. They ask that you bring a small backpack to store your water. 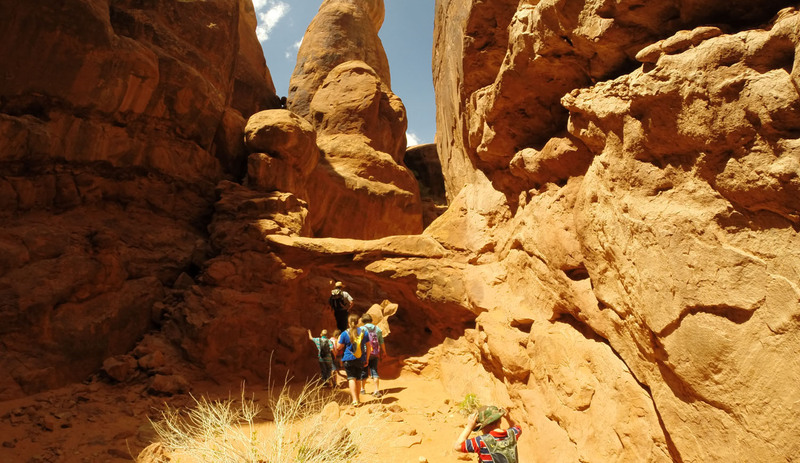 Each of our kids had a Camelbak-like pack. This is noteworthy because the three hour tour was a bit long for little kids drinking water at-will. The ranger had to give us special instructions on how to use the restroom. If you’ve got to go, just ask so arrangements can be made. 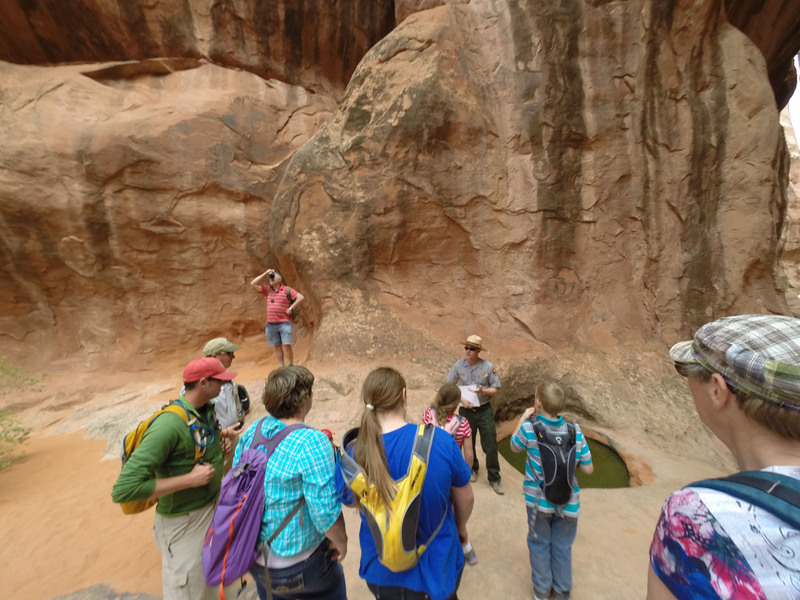 The ranger-guided tours never exceed 25 people. I think we had about 20 the day we went. Because the area is so secluded and a limited-access area we didn’t feel the 20 person group was large. It still felt reasonably quiet and private. In order to assure the safety of everyone present, the guide encouraged us to follow him in a single-file line with a more slow-paced hike directly behind him. Most of the time you’re walking. When the group gets to an obstacle the guide demonstrates the safest way to cross. Be advised that the first part of the tour is easy with only one or two climbs. The second half of the tour is more physically demanding. We really enjoyed hearing about the various ecosystems and wildlife. 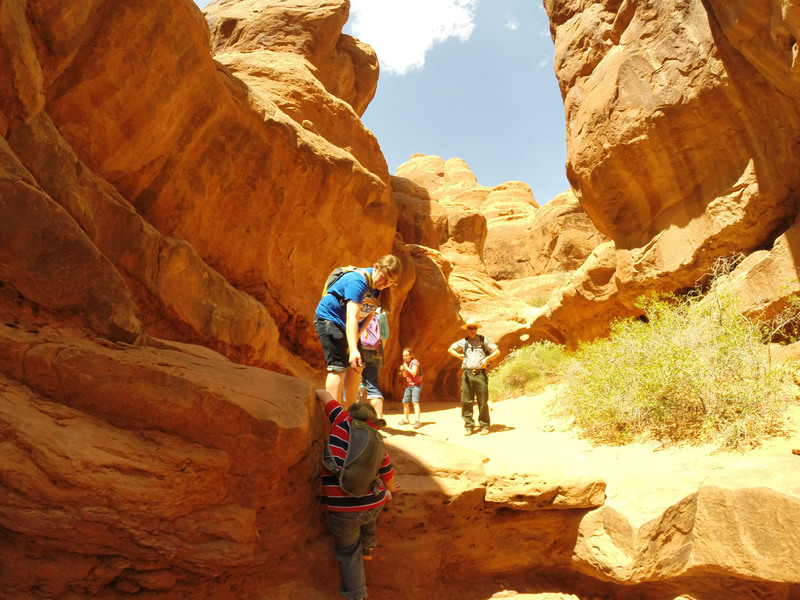 Our guide was knowledgeable about each arch and the surrounding landscape. He interacted with the group and loved calling on the children for answers. My kids enjoyed asking him questions and helping out with the demonstrations. I was so concerned about the “difficult obstacles” that I assumed I’d have to help carry kids in some places. I thought they would be really scared. Boy was I wrong. The kids lead the pack and loved it! Parker (5 year old) was a little nervous coming through one section but fearless the rest of the time. We didn’t think the tour would really last three hours, but it did and we were so happy, we didn’t want it to end. Of course the kids were ready to rest after the adventure. At the end of the tour, he stayed around to answer any questions we had and to point out a family of foxes in the shrubbery near the restrooms. My kids were so excited, they couldn’t resist sharing this treasure with everyone around. It was an amazing three hours and I can’t wait to go back!!! 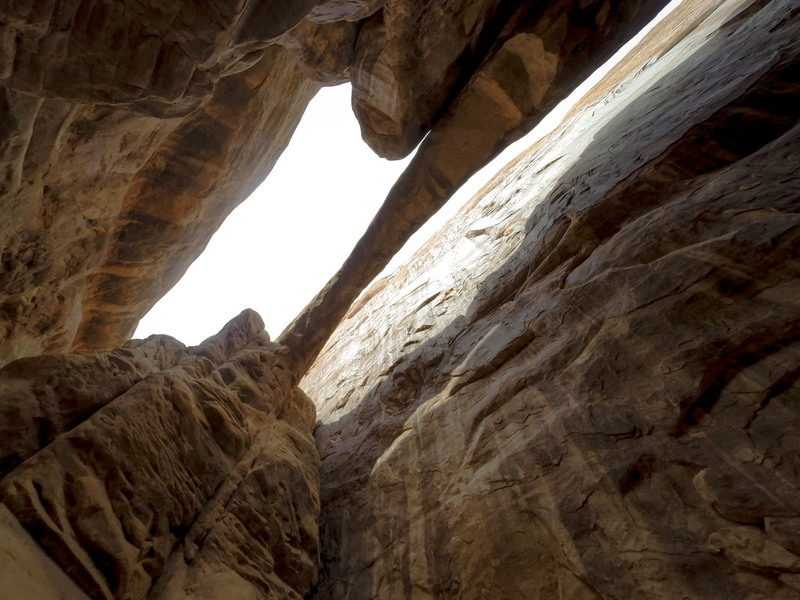 They do allow individual permits so you can explore on your own. However, this can be very dangerous because so many get lost in this area. You still have to have a permit. 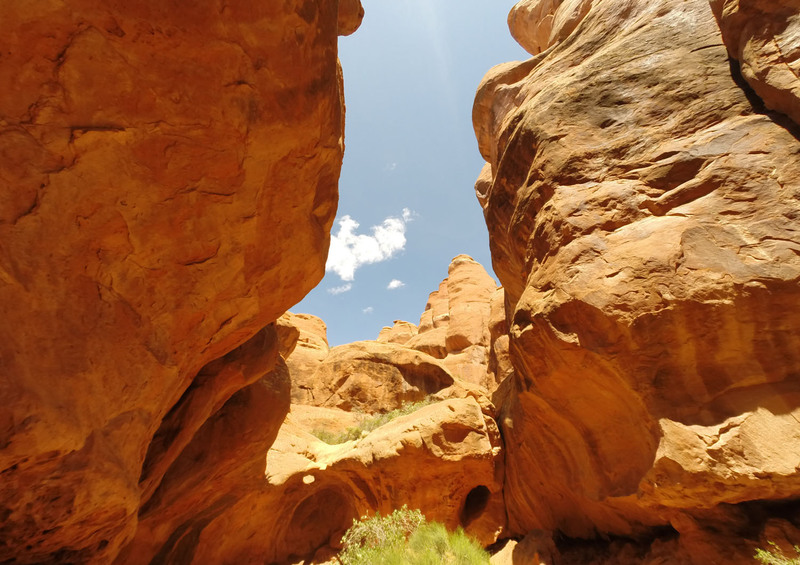 The permit is not expensive and allows you access to the Fiery Furnace during business hours (from sunrise to sunset). 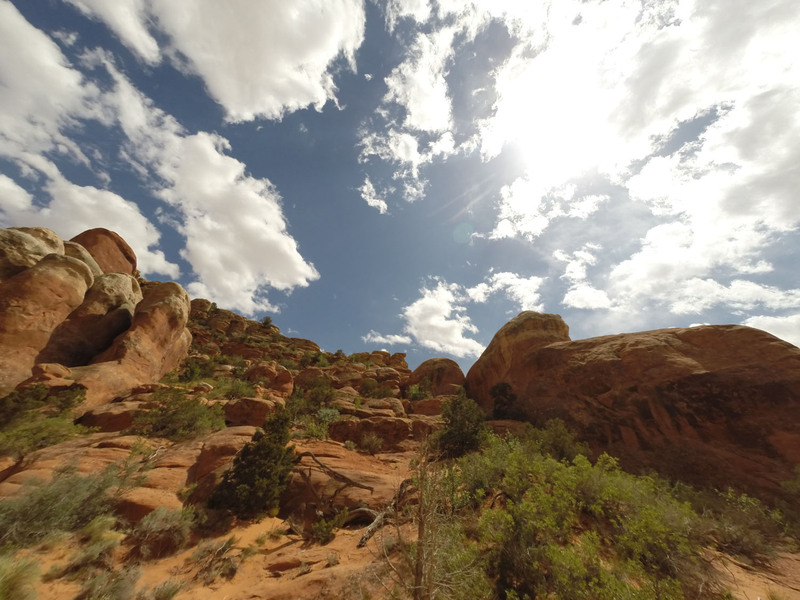 If you opt to do the self-guided tour, be aware that you are required to watch a short orientation video prior to your hike. And, everyone from your party with a ticket MUST be present for the film. Visit www.Recreation.gov for more details. 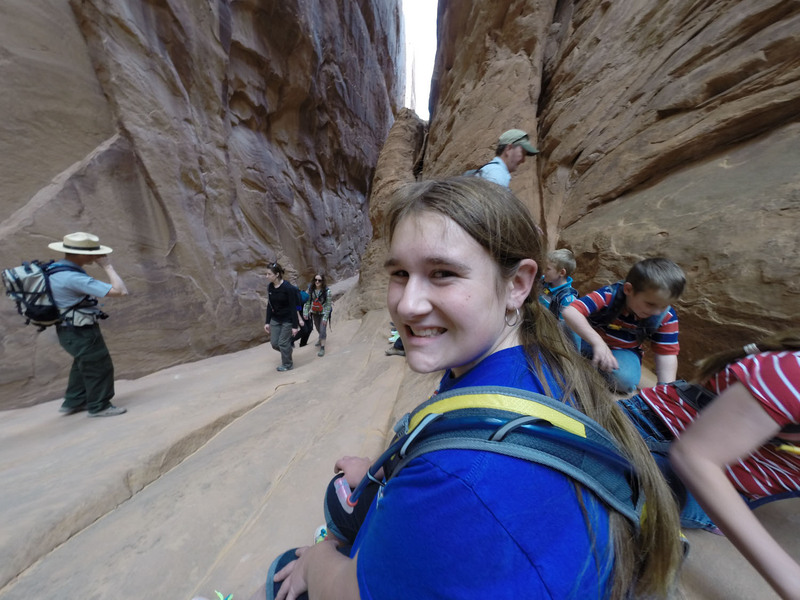 Note: We were so concerned about the difficulty of the hike for the kids that we brought the smaller and lighter GoPro camera for this adventure. We apologize that some of the photos are a bit distorted and the video (coming soon) is slightly distorted in places.